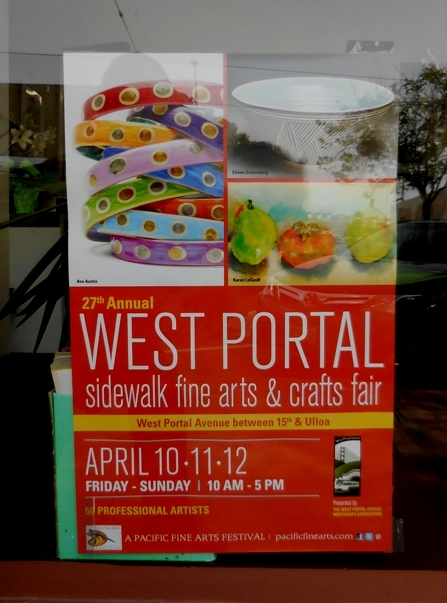 The weather for the West Portal Arts and Crafts Fair today was sunny and cool, perfect until the wind started gusting around 4 p.m. I stopped by to revisit some of my old favorites and also to see what was new. 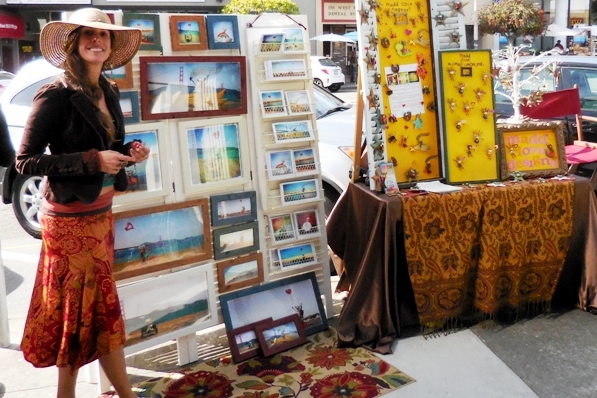 The Zapotec rug weavers didn’t come this year, but some of the other craftspeople were back. As usual, it was a delightful mix of wood work, fabric creations, jewelry, fine art, and also some interesting things like scented candles, fur toys, and organic skin care. There were also boxes made of books, handthrown ceramics, and more art than I could possibly really see. The poster said it was 50 artists. They were spread across the first two blocks on the North side of the street, and the middle block of the South side. Of course I didn’t get to them all, but here’s a selection of what I did manage to look at. 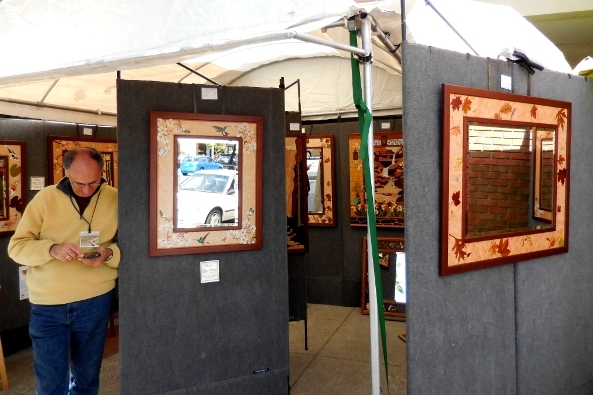 If you like the look of it – they’re there Sunday until 5 p.m. These beautiful mirrors are in inlaid wood marquetry frames, and even whole pictures made with special woods. They’ve come in previous years, and I always stop for a look. 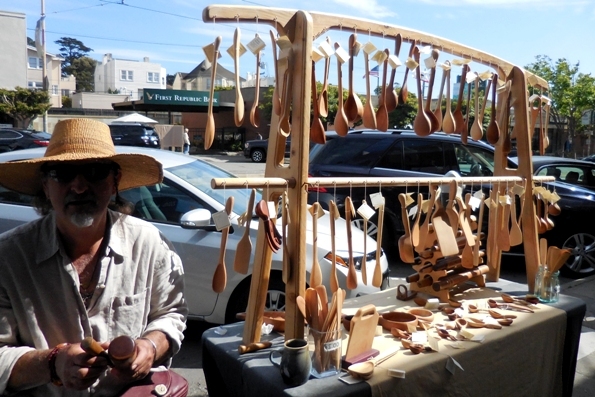 Another old favorite is Moonlight Shenanigans – hand-carved ladles and spatulas and more. They’re graceful in their designs and lovely to touch. I said as much as I bought yet another piece from David Rully, maple-wood salad servers this time. “I spend a long time sanding each piece so it feels smooth and soft,” he said. I also couldn’t resist the wooden toys made with safe dyes. I bought blocks and a train for a little relative. There were also airplanes and trucks, some with animal shapes in them, and fire engines. And some sleek army tanks, which caught the attention of a small group of boys. Who could blame them? The tanks were really elegant and minimalist, and yet rolled perfectly. 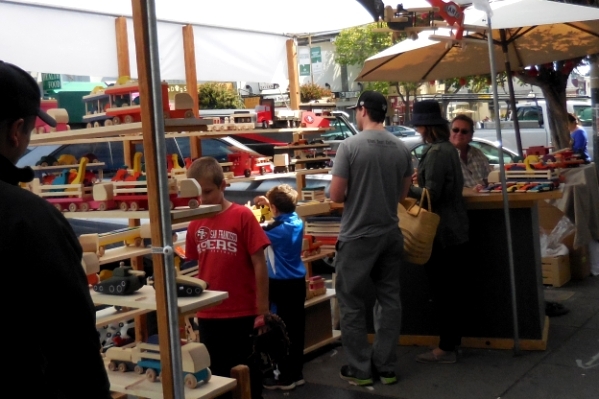 Across the road, there were more things for little ones – adorable clothes, mostly for tiny girls. Last year, someone had a stall specializing in cute clothes for boys; looks like they’re alternating years! 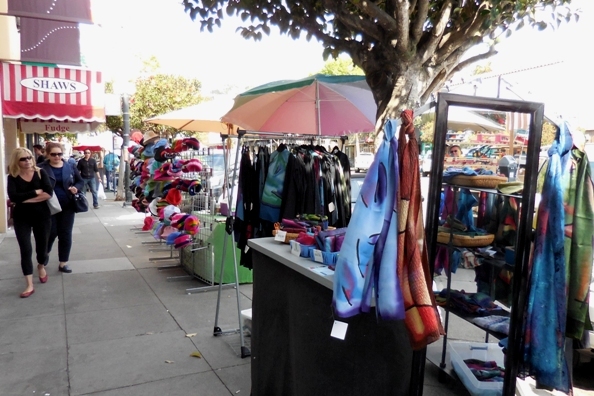 One stall had handmade silk scarves and dressy over-shirts in lovely colors. Next to it was a vendor with caps and hats, mostly for women but with a few for men as well. Close by, a stall displayed serene watercolors of landscapes and flowers in a dreamy sort of style. I stopped on the corner near the Starbucks, where there’s usually a stall with dramatic jewelry, and sure enough she was back this year. 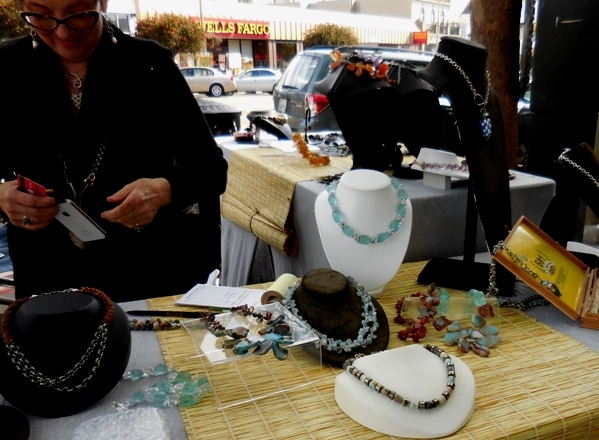 I got her card: Gayle Mayhew of Fun Girls Jewelry and a slogan, “If it’s not fun, what’s the point?” It was beautifully set up, with these strong pieces in pearls and stones and glass. A mirror hung next to it to encourage people to try things on, so I did. And then came a sudden gust of wind, and it blew down the display forms. 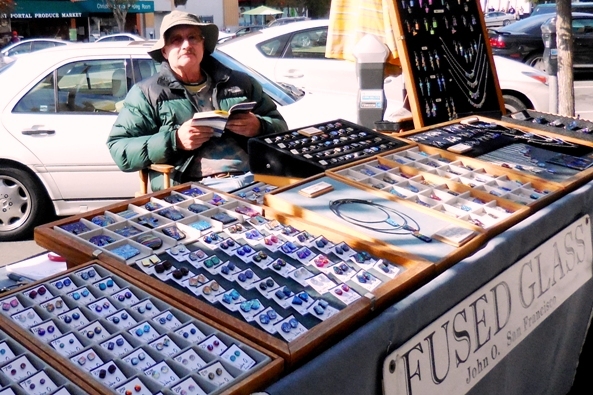 We all scrambled to catch the necklaces before they fell, and then she rearranged her stall. None of the vertical displays were doing well so she laid them flat. But they all looked wonderful anyway. 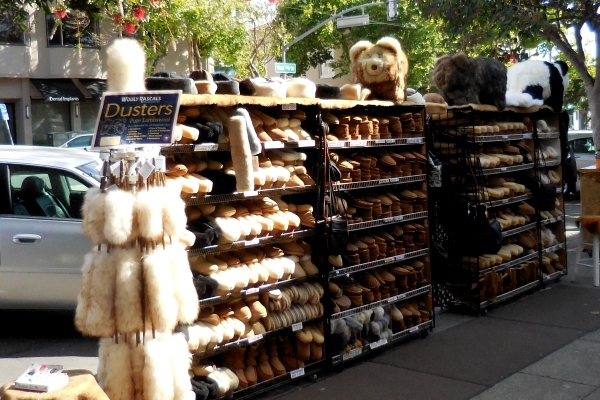 The Wooly Rascals stall of sheepskin products (shoes and slippers, dusters and stuffies) was on the first block. I bet this looks really inviting on a cold day. 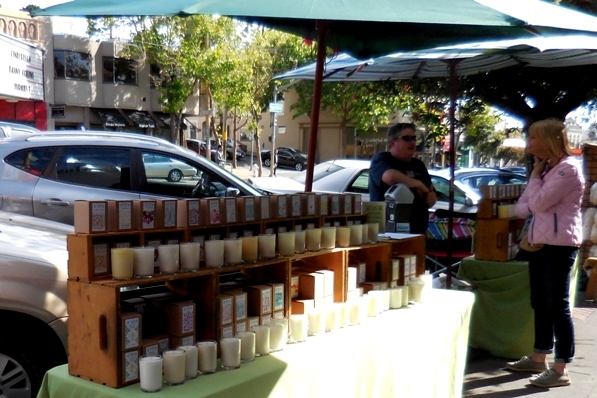 Next to it was a stall of fragrant candles. 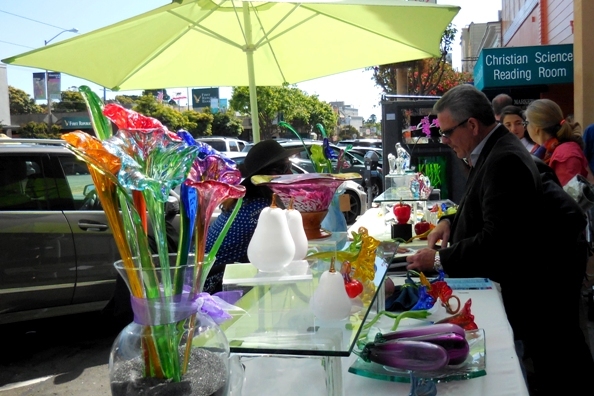 This stall had glowing colored art glass objects, as well as some statement pieces like the pears and aubergines in the picture and some luminous glass plaques. 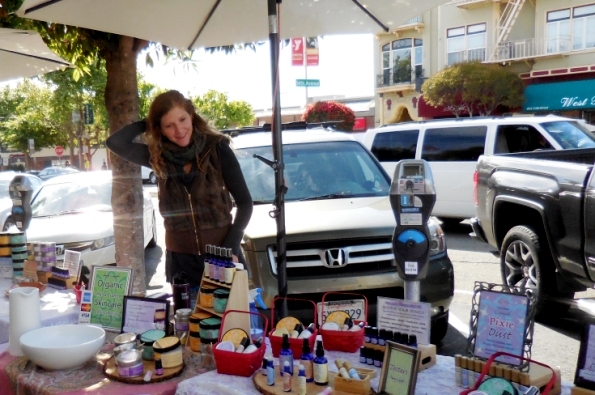 I didn’t catch the vendors’ name, but it looked lovely. 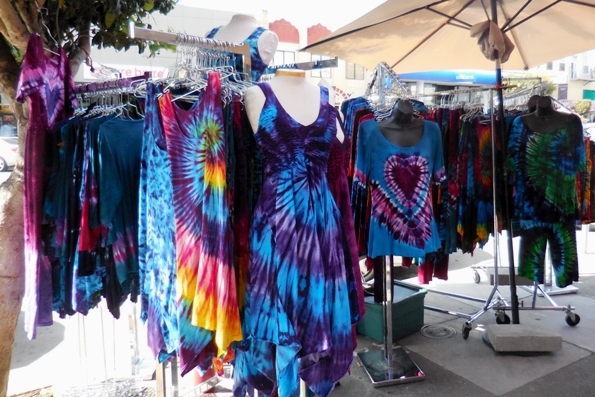 Across the street, I saw these colorful tie-dye clothes. 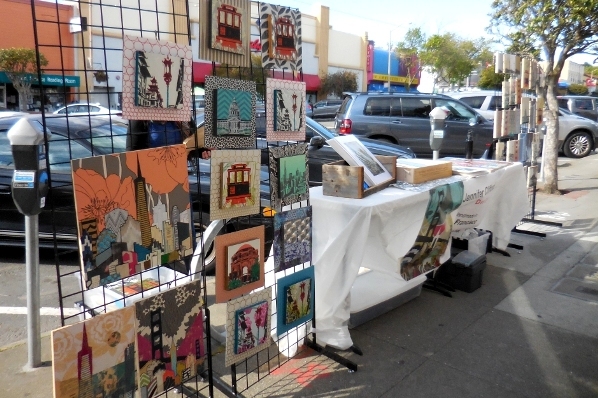 They’re by Susan Baker, of Rad Rags of California. She has an Etsy store online. The sun-dress in front is one of her best-selling items, probably because of its graceful drape. 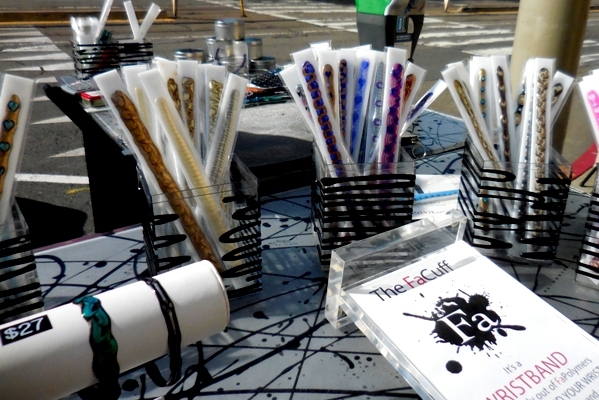 One unusual item: polymer bracelets in fine designs that wrap round your wrist and are light and waterproof – the FaCuff from Ava Austin. I don’t wear bracelets, or I’d have been very tempted by their delicate intricacy. If they come back with necklaces next year, I’ll pretty certainly get one. Madd Love Designs is humorous art with a mission to promote awareness of the 5th World Conference on Women. 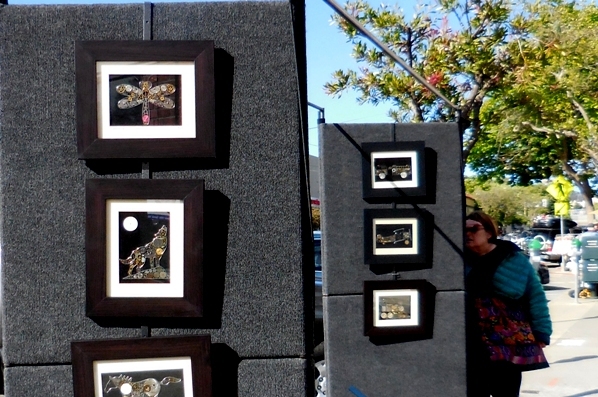 It was mostly pins and magnets of little wire and yarn people and monsters – and artworks of photographs of these little characters by the Golden Gate Bridge. Quite charming. Dichroic glass looks so wonderful in the sunshine, and is so difficult to photograph well. You’ll have to take my word for it. The colors here were gorgeous: brilliant turquoises and teals and golds and magentas. 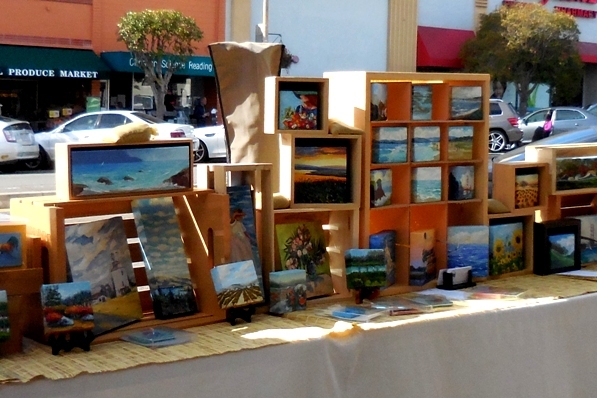 This stall had a whole lot of little canvases with landscapes (more seascapes, actually) and still lifes. Just after I took this picture, another gust of wind blew down the display. I hope nothing was damaged. 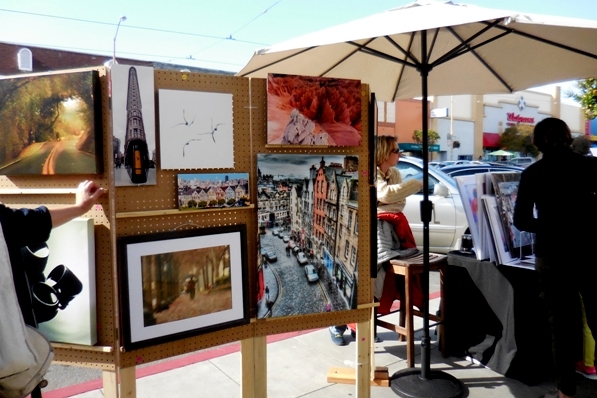 Jennifer Clifford’s pieces are collages often featuring San Francisco landmarks and a creative use of materials. In the picture with the orange poppies below, the windows of the Transamerica Pyramid are made of a golden lace that perfectly nails it. There’s more on her website. These pictures, made from gears and other parts of clocks and watches, had a steam-punk sense to them. The construction was careful and clever. Unsurprisingly, the shop is called Time Craft Designs. The website has close-ups of the designs – and their titles. 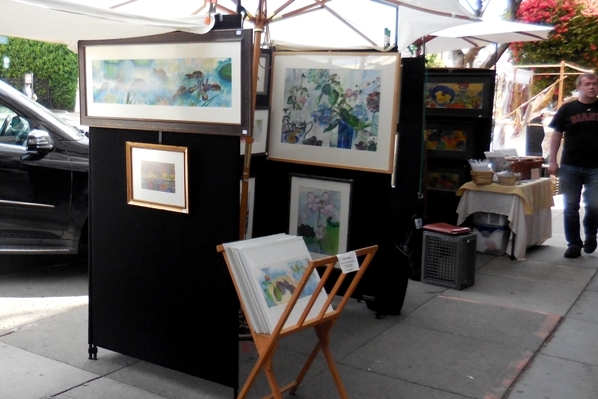 This selection of art prints was eye-catching. I especially liked the one with the tall old houses; there’s something about that perspective. Thank you for the info on the fair. I appreciate. I’ll try and go this afternoon and have a look.